What does an adult luna moth eat? Nothing, because it has no mouth. These short-lived insects are among those that students collected and are displaying in the halls of the biology department, along with posters on the interesting characteristics of 12 different insect orders. “The first day, I flinched,” says Emily Fu of the Emory Maymester course “Insect Biology.” She recalls feeling queasy as the professor, Jaap de Roode, showed a series of close-up images of creepy crawlers. Fu and the 11 other undergraduates in the class created a buzz in the biology department recently when they unveiled dozens of pinned and mounted specimens they collected during four field trips. The students also displayed scientific posters they created for insect orders that particularly intrigued them, wowing guests at the reception with their newfound knowledge. Add crunch to your lunch: As the human population burgeons to 9 billion, insects are looking like the future of food, according to a recent U.N.report. The female large blue butterfly, for instance, has evolved to hang out around ant nests. The butterfly lays eggs that hatch into caterpillars that look like, and smell like, an ant larva. “Some ants are tricked into taking care of the butterfly larvae,” Fu says, adding that the ants will even fight to protect the butterfly babies from parasitic wasps that try to lay their eggs inside them. When the ants attack one of these egg-laying wasps, however, the wasp releases a pheromone that drives the ants into a frenzy. The ants end up attacking and killing each other instead. “A lot of crazy stuff is going on in the insect world,” muses Tufayel Ahmed, a senior majoring in biology. 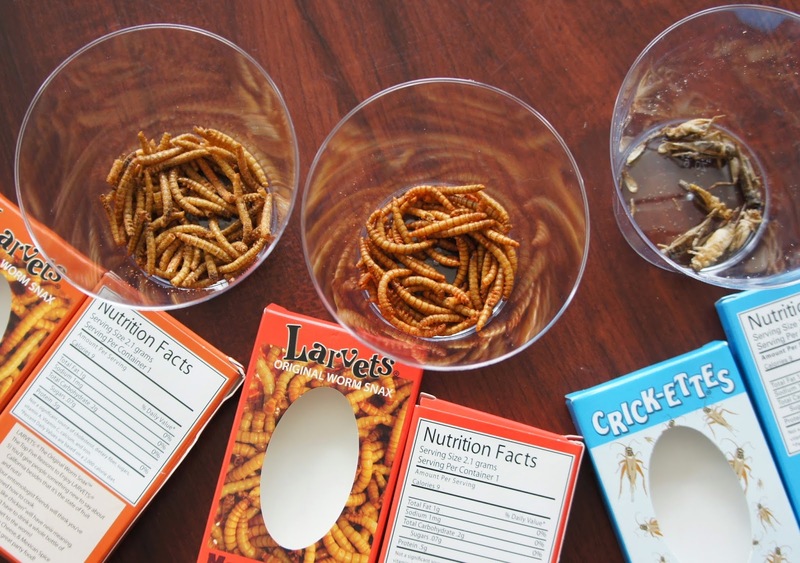 A snack table was laid out with nacho-cheese Doritos, mealworm beetle larvae seasoned with Mexican spices and salt-and-vinegar crickets. “The crickets are a bit stale,” warns Wilson Hunt, a junior majoring in biology whose poster was entitled “Orthoptera as Food.” While they may not be fresh, he adds encouragingly, they contain 60 percent protein, versus only 18 percent in a burger. In addition to new culinary experiences, the reception gave guests a leg-up on vocabulary. “Every bug is an insect, but not every insect is a bug,” says Alycia Patton, a senior majoring in biology. She explains that the forewings of true bugs, one branch of an evolutionary tree, are thick and leathery where they attach near the body and thin and membranous near the tips. Another defining feature: Mouth parts that can pierce the tissue of a plant or another insect. Patton traces her love of entomology back to her childhood. She enjoys finding unexpected beauty in the tiniest of insects, like the vivid colors of the candy-striped leafhopper. Maura Sare, a junior majoring in biology and environmental sciences, overcame an aversion to touching insects during the class field trips. “Most insects aren’t going to bite you,” she says, and many have evolved much more interesting ways of protecting themselves. Stone Mountain was the site of one of the class collecting trips. As if bees didn’t have enough to worry about. Head first: Biology post-doc Daniel Kueh dropped by the reception and learned that crickets are like potato chips. It's hard to stop at just one. Pesticides and pathogens have been linked to a rise in colony collapse disorder, which is causing mass disappearances in honeybees. The issue is under intensive study due the importance of these insects, says Nikki Mehran, a senior majoring in biology. 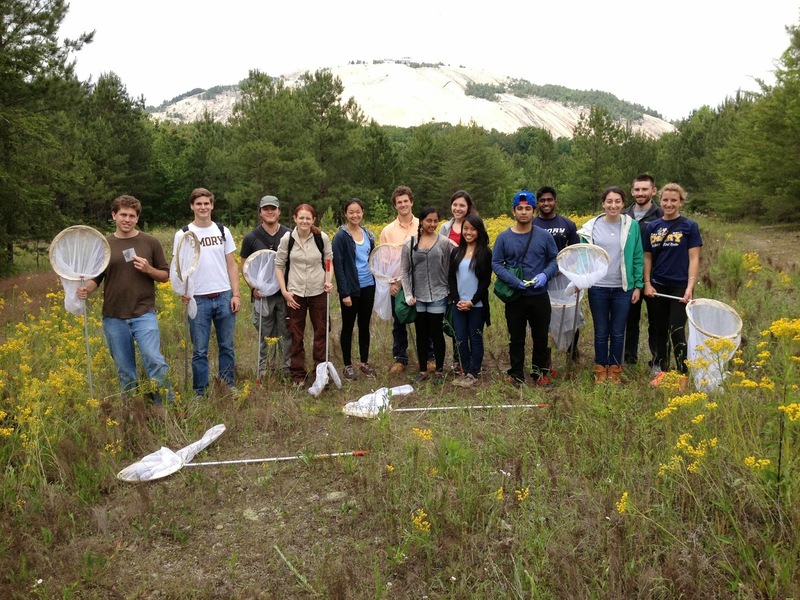 The “Insect Biology” class was launched this spring by Jaap de Roode, an evolutionary biologist whose lab is one of only a handful in the world focused on monarch butterflies. “More than half of all animal species are insects, and they are extremely important for many things, from health to ecology,” he says. Credits: Luna moth by Shawn Hanrahan; insect snacks and Daniel Hueh photos by Carol Clark; Alycia Patton photo by Malia Escobar; field trip photo by Jaap de Roode.